Keep all your pledges one with another (D&C 136:20). We make many promises in our lives. Sometimes we give our word that we will do something; sometimes we sign our name agreeing to the terms of a contract; sometimes we shake hands to make a bargain. We use our right hands in different ways as we make promises. In court we raise our right hands to promise to tell the truth. We pledge, or promise, allegiance to the flag by placing our right hands over our hearts. And we use our right hands to take the sacrament and renew our promises made at baptism. The right hand can be a reminder to do right things and to keep our promises. Mount page 13 on heavy paper, then cut out figures and chain along broken lines. Glue sides A and B together on each figure. Read “Love Fails Not” and use finger puppets to help you retell story during your family home evening. Damon hurried along the cold stone passageway beneath the castle. He was looking for his friend Pythias, who had been arrested by the king’s soldiers. Damon searched among the prisoners until he found Pythias, who was chained in a dim corner of the dungeon. “Why did they bring you here, my friend?” asked Damon. The two young men did not hear the outer door open as the king entered the dungeon. He stood listening to the boys talk. The king laughed aloud. “So, you would come back to die if I would release you to say good-bye to your parents?” the monarch asked skeptically. “How do I know that you would keep your promise?” roared the king. His eyes glared. The king could not believe his ears. This would be an interesting story to tell﻿—a boy willing to risk his life for the promise of a friend. “I will grant your wish, Pythias,” said the king, “if Damon will take your place.” And so it was. 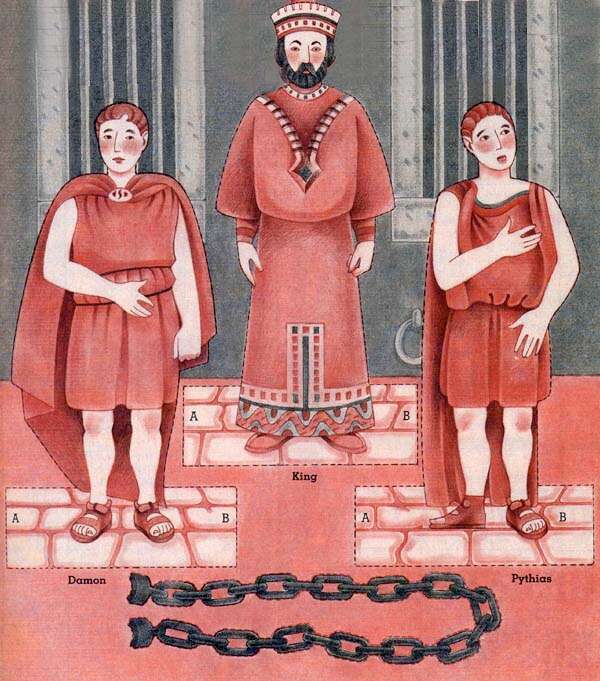 Pythias was released, and Damon was chained in his friend’s place. Many days passed. The king came to the prison to taunt Damon. “You will die for your friend﻿—he has not kept his promise!” jeered the king. “Pythias always keeps his word,” replied Damon calmly. Finally the day of the execution arrived. Many people came to mock the boy who had entrusted his life to his friend. “We told you that he would not return,” they jeered. Damon smiled as Pythias rushed to take his place. Storms and misfortune had delayed him, and Pythias could hardly breathe after his hard run. “I made it, Damon!” he panted. “I knew that you would,” his friend replied. Have each child prepare set of finger puppets. As you read story, they could hold up character who is speaking. Assign three boys and one narrator to role-play story. Use simple costumes. Have children trace their right hands on paper and think of promises or pledges that they have made. Have them write promises that they have kept on fingers of traced hands. Discuss Moroni 7:16 (how to tell good from evil) and Joshua 24:15 (verbal promise to love right and serve God). Sing “I Pledge Myself to Love the Right” (Sing with Me, B-47).